The Associated Press reports an announcement from Burger King Corp. that they plan to update the look of their stores. The updates include a focus on red, brick walls, chandeliers, and TV screen menus. According to the report Burger King’s largest customer segment has been young males. This theme would appear to cater towards that segment. It looks like Burger King will possibly see some resistance from franchise owners based on the price tag for the upgrades. My first impressions after looking at photos of the new template were that it looked very modern and urban. Being honest, I eat at a Burger King about once every three years. There’s a franchise less than a mile from neighborhood entrance, but we just don’t go. I’ve always classified Burger King in the same grouping with McDonald’s and Wendy’s being fast food and burgers oriented. This competitive strategy is definitely intended to put Burger King in a new mindset with consumers. It appears they are targeting more sophisticated customers, their core male following, and customers looking for more atmosphere. Can Burger King create a unique market play that differentiates itself from other fast food operators? Can Burger King turn a traditional fast food chain into a restaurant with atmosphere where people want to hang out and meet friends? Will Burger King still market and target to families with small kids? Will this change ultimately lead to big changes in the menu offering? By this I mean getting away from the low margin 99 cent menu and more towards a higher priced burger with more choices for side dishes. Will this competitive strategy work in conjunction with their drive-thru business or will it cannibalize sales of the drive thru? What about customer service policies and community involvement? That’s part of how Chik-fil-A has created a unique brand and experience for its customers. Will Burger King franchise owners seek out community involvement to make it more of a neighborhood grille? In an informal study, I showed my kids (13 female and 11 male) the picture of the new design. Neither of them were moved by it. But I don’t think they are the target audience. What do you think? 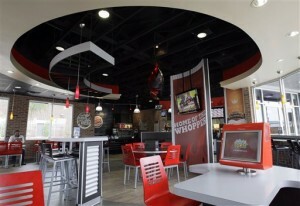 If you don’t regularly eat at Burger King anymore would you be willing to try a meal in the new redesigned store? Can a fast food restaurant re-brand itself in the mind of consumers to be something more?